What's Really Happening in the Infinity War Post-Credit Scene? After all of the speculating, waiting and preparation, Infinity War is finally here. If you've seen the movie, you know that the word epic barely begins to cover it. This Marvel Cinematic Universe entry has a lot going on and there is a lot to consider now when thinking about the future of the MCU. Specifically, we need to talk about that post-credit scene. Warning: major spoilers ahead for Avengers: Infinity War, so if you haven't seen it and don't want to have the surprises revealed, then turn back now. To fully understand the post-credit scene, we need to talk about the ending. Despite the fact that The Avengers and the Guardians of the Galaxy did everything they possibly could, Thanos still managed to get his hands on all six of the Infinity Stones. Once he did, with the snap of a finger, he was able to wipe out half of life in the universe. That includes many of our heroes, who crumbled to ash before our eyes. Thanos then returns to his home planet to soak in his victory. 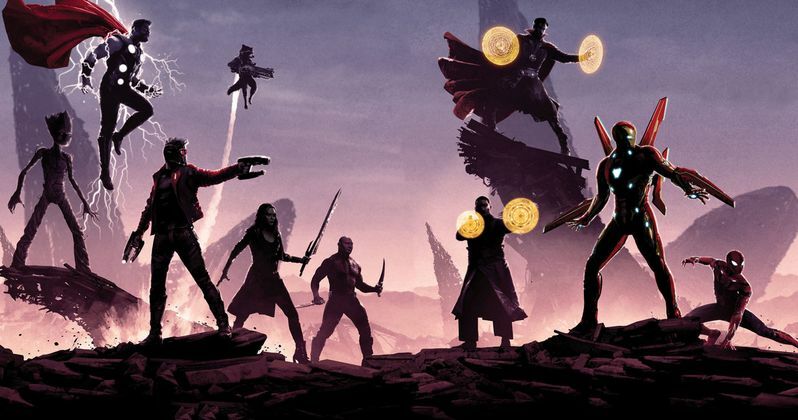 Despite how many characters appeared in Infinity War, there were several who were unaccounted for during the main events. The post-credit scene resolves part of this, as Maria Hill (Cobie Smulders) and Nick Fury (Samuel L. Jackson) are driving together when they receive the distress call about the battle going on in Wakanda. The two scramble to try and figure out what is going on when the world starts to fall apart around them. People are turning to ash as a result of what Thanos has done. Cars are crashing, a helicopter falls from the sky and explodes after hitting the side of a building. Chaos. Nick Fury and Maria Hill recognize something needs to be done, but it's too little too late. Well, almost too late. Hill, unfortunately, crumbles into non-existence and Fury has mere moments to do something. He pulls out a fancy, high-tech pager and sends out a distress call. He then meets the same fate as Hill and many of the other Marvel heroes, crumbling away. Jackson nearly gets to sneak in one of his signature "motherf****r" lines before losing his life, as a fun little nod to his career in the tragic moment. The pager Fury used falls to the ground and we can see that a signal is being sent. The signal is received and, for a moment, we don't know who by. But then an unmistakable red and blue pattern with a star right in the middle comes up on the screen. That's right! Captain Marvel is coming to help! Brie Larson will be playing the hero in the MCU, but she has yet to appear in an MCU movie. It looks very much like she's going to help what heroes remain when Avengers 4 rolls around. Captain Marvel, aka Carol Danvers, will star in her own solo movie, which arrives in March of 2019, just a couple of months before Avengers 4 comes out. That movie is going to be set in the 90s, prior to the events of the first Iron Man and the majority of the MCU. While it still hasn't been explained where she has been during the other major events in the history of the MCU, it's possible she's been out somewhere in space dealing with other threats, since the Captain Marvel movie is going to be a cosmic adventure. But the ramifications of what Thanos has done are too great to ignore. The universe is going to need all of the help they can get, and Captain Marvel is a powerful hero. Marvel has teed up something very exciting here, it's just a shame we have to wait a year to see it unfold.